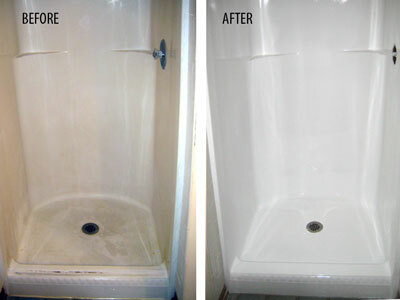 Why replace your bathtub when you can have it refinish and resurface your tub for a fraction of the cost, time and mess? Badger Bath Specializes in, tub refinishing, bathtub reglazing and repairing bathtubs, whirlpool tub, hot tub and showers of all shapes colors and sizes. Bath tubs, showers, pools, cultured marble vanities, sinks, windows, whirlpools, hot tubs, and tiles, we do it all. If your fixture is worn out, scratched, chipped or stained, Badger Bath can restore, refinish and reglaze your tub to "like new" condition in no time. 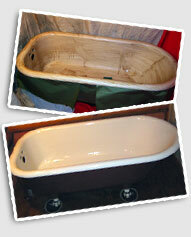 (Some tubs are too damaged for refinishing, in these situations we recommend a bathtub-liner ). In addition to tub refinishing, Badger Bath also offers tile refinishing, bathtub conversions, tub overlayments, bathtub liners/ wall system installations and we sell and install bathtub accessories including shower doors, curved shower curtain rods, tub and shower seats, non-slip skid mats, shower grab bars, soap dishes and much more. At Badger Bath, all bathtub refinishings, reglazings and resurfacing come with a 100 percent satisfaction guarantee and a full warranty. We use the highest quality products available on the market and our customer service and quality are unsurpassed. Contact us for a FREE consultation. Our professional staff will have your bathroom looking brand new in no time. Please refer to the photo gallery for pictures of this process.